In “Social Insecurity? Internet Turns Boomers Into Twits,” [May 5, 2017], Future Tense columnist Teddy Wayne urges older people to get the heck off social media. His position is both ageist and clueless, not to mention downright nasty. The problem isn’t that Trump is tweeting, it’s what he’s tweeting. 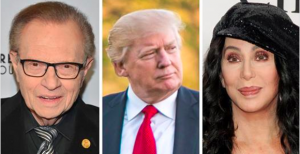 Sure, Cher’s post is dopey; who cares? Like love, social media can make fools of any of us. The same day’s “Modern Love” column describes a college student trapped by her carefully cultivated Instagram persona. Like everywhere else, the internet needs to be a place for all ages. Yes, millennials led the development of social media, but they stood on the shoulders of those who invented the internet and consciously brought it online in 1964 as a way to connect people. Generational divides aren’t just contrived, they undermine a thriving and equitable culture. FYI, Facebook hosts two of the largest crochet groups in the world, very lively groups where we share patterns, help and ideas, not to mention chat. And, again FYI, there are quite a few younger ladies in there.